I have never tried this hard to eat right and not drink wrong! I have been soda free for over a week now and I'm feeling good. I'm eating right and the weight is slowly coming off. I think I'll hit the park tonight for a run. Every time I stop and start to exercise it gets so much harder. I'm back to running as much as possible and on my 3rd day of eating right. The running is very discouring because I can only manage running for less then 20 minutes before my lungs and legs feel like they are about to burst. I've been at this point before and know I'll go further with time and effort but it sure feels like it is taking more to get beyond this point. My mind is not in the right place either. I know the good feeling is just a workout away but it is sure hard to get out the door to start. The eating is not going to bad. In just a couple of days I can see results on the scale. I am missing my Diet Coke! The big run has come and gone and I'm still alive. This past Thanksgiving I got up early and made my way along with one of my brothers to downtown Atlanta. 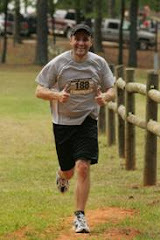 It was cold at the start of the Atlanta 1/2 Marathon but I was soon sweating. With every mile my brother asked if I was OK and with every mile my answer was no. I hurt from step one and by the end I didn't think I could finish. I could see the end and still wanted to stop. I was not at all ready for this and for the first time in my life actually worried that I may have some kind of medical problem on the course. Since this time last year I have gained 30+ pounds (lost about 10 for this race) and did not have the time nor put in the quality runs to be ready for this run. But I made it! I finished with a time around 2:07 was happy was the effort. I walked long enough in the aid stations to drink and then got back to running. My brother put in a great effort and now wants more. During the race he said that a marathon was too far and he would be happy to do another 1/2. I knew he would change his mind after a few days of rest and that has already happened. He is talking full marathon and I'm going to give it another try. That race last year left me feeling like I failed. I finished a marathon but I want to run a marathon. So, training for the marathon starts! About a month and half ago I said to my older brother "if your coming in to town for Thanksgiving, why don't we run the Atlanta half?" What a mistake!I think I'm in for a long day. I found a new park to run in and it is great. It is actually the same park that I run in a lot but a different section. I ran on both Saturday and Sunday. The run on Saturday was great, not far but it felt good. It felt so good that I went back on Sunday and planned on running a trail that I saw through the woods. This turned out to be a mistake. I started running and this thing went straight downhill. My knees are still hurting 3 days later from the pounding they took running for nearly a mile downhill through the woods. Because of the pain I did not run the last couple o fdays but I did go for a swim on Monday and a bike ride last night. I'm just as far out of shape on the bike and in the pool as I am running but it felt nice to start and the bike made my knees stop hurting.